In a highly charged Commons Debate and free vote in London last Thursday, the UK Government was defeated by politicians and the nation who now demand an outright ban on the use of wild animals in circuses rather than a system of licensing. 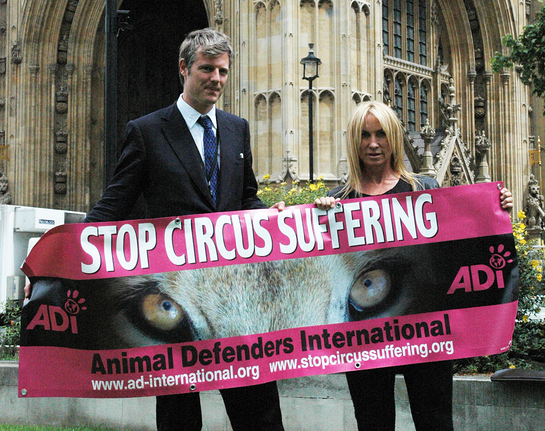 Zac Goldsmith, Conservative MP for Richmond Park & North Kingston was supportive of the all-party motion, which called for the introduction of “regulation banning the use of all wild animals in circuses” from July 2012. Celebrity designer and Animal Defenders International (ADI) Ambassador Meg Mathews also attended the Commons to pledge her support to the ADI campaign. Jan Creamer, Chief Executive of Animal Defenders International said: "We applaud Zac and Meg for playing such a proactive role in securing the debate, vote and victory and for helping to strike a historic victory for animal welfare and protection. Over 50 MP’s from all the major parties unanimously backed the ban, and the Government has signalled that it will introduce one, ending forever the days of lions, tigers, elephants and other wild animals in the big top. To maintain the momentum and ensure that Government keeps to its word, ADI is calling on people to write to their MP and Defra, requesting that they respect the will of the nation and implement a ban.